Edmond Vandercammen was an important part of the Belgian avant-garde beginning in the 1920's, his career as an artist lasted about fifteen years. In the 1930's he abandoned painting to pursue his poetry. In the 1920's Vandercammen exhibited in Paris with Flouquet at Galerie Povolovsky. Flouquet was Belgium's most well known modern artist. In 1927 he exhibited in Paris with Brancusi, and in 1931 he had a one-man exhibition Turin, Italy. Though widely published as a poet, his accomplishments as an artist went unrecognized until the early 1980's when a group of his paintings were acquired from his family. In 1981 Galerie Bortier, in Brussels, organized a retrospective of Vandercammen's paintings. In 1987 Galerie de Jonckeere, also in Brussels organized another exhibition. Galerie Mostini, and Whitford and Huges in London began to exhibit works by Vandercammen. Papillon Gallery acquired several paintings directly from the dealer in Brussels who was represented the Vandercammen family. 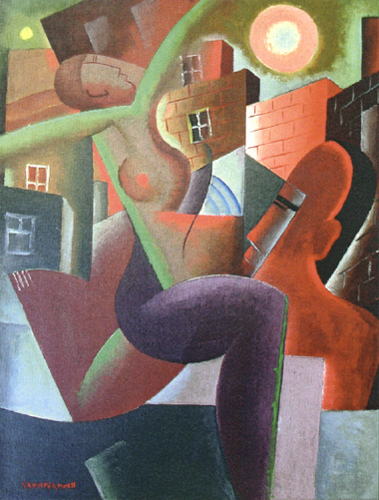 Vandercammens paintings are typical of the Belgium school of modern painting, cubist and surreal, colorful and complex. As with many overlooked artists of this century, Vandercammen's contribution to modern art will have to be included in any future exhibitions or books on the Belgian avant-garde.